The Fez train has finally pulled into the station and like so many others, I am on board. Years after the game was announced by Phil Fish, its creator, it finally sees the light of day on the Xbox Live Arcade. While I have heard the buzz, I largely entered into Fez completely fresh. The perspective-flipping vertigo and riddling took me completely by surprise. I walk away from each play session part overjoyed at the game's creativity and partly deeply frustrated. I tried hard not to spoil Fez for myself and look up cheats. I really did. I remember Jonathan Blow's attempt to dissuade the use of walkthroughs for Braid and I took his words to heart. 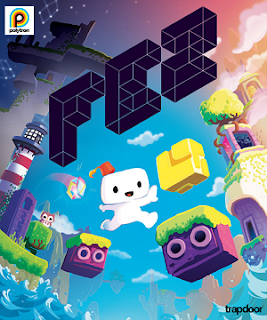 I turned off the game entirely and walked away, giving myself time to think and come at Fez with a new perspective (pun intended). Finally, in a sudden bout of what I can only call entitlement, I cheated. First I looked up how to get just one little cube, the one atop the lighthouse if I remember correctly. Then, while browsing some gaming forum, I saw mention of water levels. The world was even deeper than I thought! I kept poking around, against my better judgement, and saw mention hidden messages and an entirely different language. I found a copy of the Fez alphabet, and that was it. I was engulfed with a desire to learn about the hidden world I had only scratched myself. I wanted, not solutions necessarily, but knowledge. I wanted an arsenal of tricks to ready myself for the puzzles I would encounter. I fell down the walkthrough slippery slope. Once I had the alphabet, I could easily translate the lettering in the world. But when I found a hovering obelisk filled with letters, I figured it would take too long to translate so I looked up its meaning and, I want to say by accident but I might be denying the truth, the solution. At first I wanted to the busy work of translation, then I just wanted to skip past the thought process entirely. "I would have figured it out eventually" I rationalized. I did stop looking up walkthroughs at some point, partially because a good deal of the game is still cloaked in mystery for many of those who spend their time posting answers to puzzles online. Other aspects of the game I learned about but am intentionally avoiding, both because I want to find a solution on my own and I want to take my time with the more bizarre parts of Fez. I still find the game incredibly alluring. I have no doubt I can still enjoy the game regardless of my cheating ways. Indeed, maybe I am enjoying it more. The time it takes to go back and forth to areas, and even figure out how to retrace one's steps, is agonizing. Or I could just be rationalizing my behavior again. I'm finding the same problems. This may be the most I've cheated in any game, but I like to tell myself it's only because I like Fez so much. The thing is, the insanely difficult and ambiguous puzzles practically BEG you to look up the answers. Puzzles like the one at the clocktower would require you to play the game every day for 48 days to solve normally. The language is awesome, but there are mountains of texts in some parts that took me nearly 30 minutes just looking back and forth from my scrawled codex to the screen to translate. And most of the text is all flavor! How am I to be expected to translate every little text bubble with no certainty that it will get me anywhere? I appreciate the depth and complexity and amiguousness of the puzzles, but I don't think those kinds of puzzles can work any more in today's world. The internet is too accessible. These types of puzzles for me would have a bigger chance as a social thing. If for example I had a community online to decipher stuff with (perhaps in realtime, chatting while playing), or with an attentive friend or two at the side, having a weekend free. By myself, right now, I'm struggling, just as you. Have not cheated yet, but this is mostly I think because thre is no comprehensive walkthrough yet. For example if there was, I would have looked up if one of the artifacts could make me double jump or something, so that I could know what puzzles I am even able to solve right now. You do need New Game Plus (and it's first-person mode) for the village boiler room puzzle and the small, textless monoliths. And if you don't have a device that can decode QR codes, then you'll need NG+ for the backup throne room puzzles that give the same rewards. Pretty much everything else is solvable right away. NG+ also gives you flight, but I haven't found anything that requires it. It's just a convenience to skip the movement puzzles that you've already solved. There are forum threads discussing the various puzzles, and especially the word riddle took some group effort to solve. The black monolith still remains unsolved, though. The trouble with community-driven puzzle solving is that you had to be there at release. If you pick up the game later, you'll have answers to most of the puzzles ready in a FAQ. Most of the anticube puzzle solutions could be randomized, so the FAQ couldn't just tell you the solution, it would have to tell you how to solve it yourself. The more I hear about this game, the more I want to play it. I love audacious games, even if they bite off more than they can chew. I'm ok with a game asking a lot of its players. But like you said, when the answers are at my fingertips, it is so hard to resist. The QR code puzzle I find so strange. I know so few people who have a QR code reader. And I guess there is another way to achieve the answer without the QR code, but then I found people online saying they were confused because they saw the clue but has already solved the QR puzzle. I wonder if we'll look back on some of these puzzles as tacky or forced. Yeah, the game doesn't really communicate whether the clues are still relevant or not, and there are lots of red herrings in the game. The golden border just means that there's no secret passages or rewards left in that particular room.